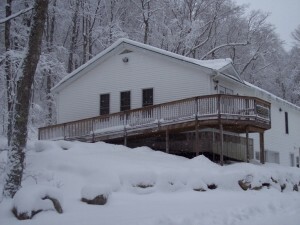 The Paumgarten Family Archival Center in early winter. The Museum has been collecting items relating to the history of skiing since 1977. 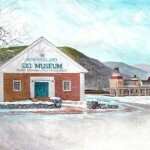 In 2003 the Paumgarten Family Archival Center opened a short distance from the Museum in Franconia Notch State Park, providing the Museum with a much-improved situation for housing the collections. The Museum’s oldest holding is a book published in 1555 containing the first printed images of skiers. The title translates as A Description of the Northern Peoples in English. Olaus Magnus, a Swedish bishop of the Catholic Church, published Historia de Gentibus Septentrionalibus in Rome in 1555. The illustrator of the woodcuts never saw a skier and created fanciful images of skis from verbal descriptions, but his work remains the first with depictions of skiers. 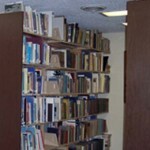 The Museum owns about 1,700 volumes, and 390 titles of periodicals. The collection of about 490 posters is also housed in the The Robert J.A. Irwin Library. 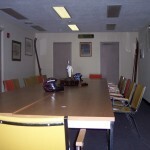 The New England Ski Areas Council Board room is useful for researchers to spread their work out, and is used for quarterly meetings of the Board of Directors. 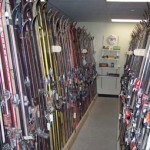 The Thad Thorne ski room contains about 735 pairs of skis, the best in the collection. Another 200 or so are housed off-site. Skis are arranged in by date, as can best be determined. 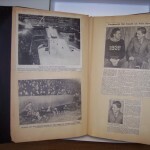 Scrapbooks are differentiated between those assembled mainly with newspaper clippings, like this one from Walter Prager, and those with photographs. 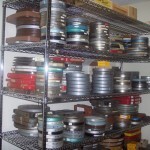 There are over 2,500 reels of film in the collection, including 2,040 100-foot reels in the John Jay Collection, the raw material from which the filmmaker’s well-known films were produced. 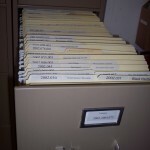 Large collections of archives are stored in record storage boxes, while the Literature files hold smaller, folder-level printed material. 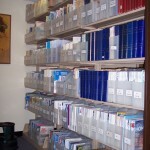 Part of the film collection in the Paumgarten Building.